The band will hit the road on the Who Let the Dogs Out trek in May. 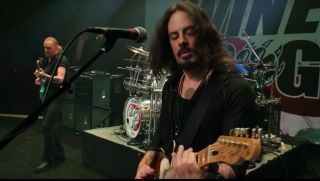 The Winery Dogs, featuring singer and guitarist Richie Kotzen (Poison, Mr. Big), bassist Billy Sheehan (Mr. Big, David Lee Roth) and drummer Mike Portnoy (Sons of Apollo, Dream Theater), have announced new U.S. tour dates for May 2019. The outing, dubbed the Who Let the Dogs Out 2019 tour, will begin in Derry, New Hampshire and wrap in Los Angeles. It will be the band’s first tour in close to three years. See below for the full itinerary, and for more information head over to TheWineryDogs.com.